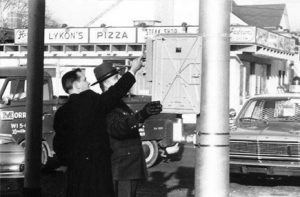 When Albert Lykon, owner of A&A, was a boy, he worked at Lykon Pizza, the pizza shop in Levittown, PA, founded by his parents, father Andy and mother Ramzy. Andy and Ramzy were both hard-working children of first generation immigrants. Andy’s parents were Czech and Hungarian and Ramzy’s parents both emigrated from Lebanon. Both Andy’s and Ramzy’s parents were extremely hard-working. Andy’s father was primarily a coal miner; in the coal region just outside of Scranton/Wilkes-Barre, PA. Ramzy’s parents made and lost their fortune several times over their adult life, with several businesses. Her father started as a huckster with a produce wagon and later owned a variety of businesses that included a steel service center, a few small coal mines and rental properties. As an adult, Andy was particularly influenced by Ramzy’s father and his bold entrepreneurial nature. As a young family, Andy and Ramzy worked hard, and every member of the family had a role to play in the business. Each of the seven children was put to work in the shop at the age of five. By the time Albert, the eldest and current A&A owner, was 10, he was managing the cash register, talking to customers, and taking orders. Tank Removal – Andy leaning out of the building to signal the crane operator; his son Nick Lykon. Patriarch Andy was a natural problem-solver and entrepreneur. When he saw an opportunity to sell pizzas into the local high schools for lunches, he seized it. Expanding these relationships, he started providing baked pizzas and the ovens to bake them in to these same high schools for selling his pizza at football games and fundraisers. Soon he was providing the same for carnivals and other community fundraising events. It was immediately clear, however, that hauling these bulky pizza ovens to and from community events was difficult. He tinkered with his trucks and trailers and figured out how to modify them, making it easy and safe to transport these heavy ovens to the venues where community events were held. Providing schools and community groups with his pizza and the ovens to cook them for fundraising became a successful side business for Lykon Pizza. 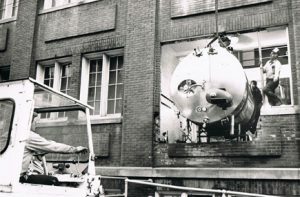 Eventually, word spread about the Lykons ability to move these ovens and other businesses began reaching out to for help with their own equipment moving needs. Soon, the Lykons were making pizza all week and moving equipment on the weekends. This exposed Andy to auctions and businesses that were selling equipment, some of which he knew other businesses were looking for. Andy took the next natural step and started dabbling in the buying and selling of used machinery and equipment. Not only was he moving equipment, he was now also successfully buying and selling equipment. Eventually, the revenues from these side businesses surpassed those of the pizza shop. The Lykons realized it made sense to focus exclusively on their machinery business and closed the pizza shop to focus on the new business. In the early years, most of the revenue came from buying and selling with the smaller portion coming from equipment moving jobs. As the years passed, this gradually evolved to be the opposite, with most of the business being generated from rigging and machinery moving. The business was initially known as A&A Rigging. By the mid 1980’s, A&A had advanced to large machine tool rigging. 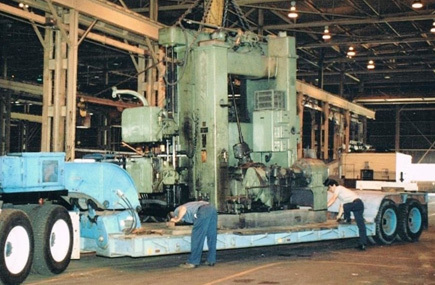 Here is a picture of 70,000# King Turret Lathe. In the early years, the Lykons had only one boom truck and a small electric forklift. But they soon purchased a rollback truck, a 1960 Mack B-61, and a few trailers. The business continued to expand and the Lykons continued to innovate, gaining a reputation for being able to do the difficult jobs. 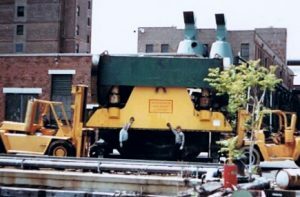 They were also early adopters of new technologies and equipment, such as being the first company in the mid-Atlantic region to use sliding axle type tilt trailers. The company’s reputation steadily grew. They were hired to work with bigger machines and make more difficult moves. By now, A&A had acquired a wide range of machinery. In 1992, A&A moved from Bristol to Tullytown, PA, which allowed them to add machinery storage and warehousing to their list of services. Then A&A outgrew the Tullytown location. In 2000, the company built a new 100,000 square foot facility on an eight-acre property in Morrisville, PA, formerly owned by U.S. Steel. This facility, designed and constructed by A&A, has 12 indoor loading docks, large grade-level doors, warehousing areas, crane bays to 35 ton capacity, separate truck/trailer and lift truck maintenance shops and a crating/skidding area. A&A also obtained two additional leased facilities within half a mile of the Morrisville facility. Today, A&A has a nationwide reputation for being able to do the difficult while providing superior service, safety, and value in the rigging, millwright and machinery moving industries. One thing has never changed at A&A: the pride in quality work and attention to detail and safety. Need help with your moving needs? Discover the A&A Difference.